From my aisle seat in row 17, I can’t help but notice that you’re boarding this commercial flight with nothing on your person but a medium-size table lamp. No carry-on bags, no books, no laptop—just an ordinary household lamp with a polished bronze finish that you’re cradling closely against your chest. Before I go any further, let me say that there’s nothing wrong, per se, with bringing a lamp and nothing else onto an airplane. This is a free country, and you’re welcome to bring whatever you’d like onto planes, provided it doesn’t pose a security risk. But you must understand that from a stranger’s perspective, seeing a person boarding a flight with only a lamp in his hands is somewhat disorienting. It raises some questions—both lamp-related and not—and I hope it’s not too forward of me to pose some of these questions here in this letter. The first and biggest question I’d like to ask is this: Why are you bringing a lamp onto an airplane? It isn’t a normal thing to do. 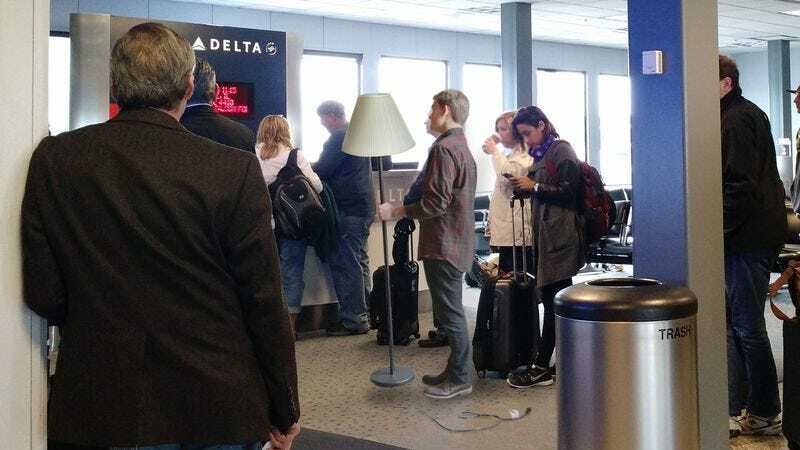 The vast majority of people in this world will never transport a lamp on an airplane, but the rare few who do almost certainly pack the lamp into a box and check it at the luggage counter. Though even that is kind of weird. If you need to transport a lamp somewhere far away, the normal thing to do is send it in the mail. Maybe you’re hoping to use the lamp on the plane, unaware that every seat is already equipped with a serviceable reading light. But I doubt it. My initial suspicion was that maybe the lamp was an antique of extraordinary value that, like a kidney in a cooler or a museum-grade diamond, must be carefully escorted by a handler. But on second glance, I can see that it’s not even that nice of a lamp. It’s fine, but it’s not something that makes you think, This needs special protection. If I had to guess, I’d say you got it at Pier 1 and it cost $65. Which brings me back to my first question: Why did you bring an unpackaged lamp onto an airplane with no other luggage? Perhaps you were nervous that the baggage handlers would break the lamp. That’s an understandable worry. I saw a 60 Minutes once where they showed security footage of airport employees basically playing volleyball with a box labeled “FRAGILE.” But if you wrapped the lamp up real good in Styrofoam and stuff, I’m sure it’d be fine. And it’d certainly be safer than stowing the lamp in an overhead bin—it’s like a demolition derby up there. Maybe you’re hoping to use the lamp on the plane, unaware that every seat is already equipped with a serviceable reading light. But I doubt it. You look like a pretty normal guy who knows how things go on airplanes. And, honestly, this is what’s most perplexing to me. If you were giving off strong lunatic vibes, then this would all make much more sense. Like, hey, there’s a lunatic with his pet lamp. But you look so sane and put-together that I’m really at a loss. Here’s something else that’s really eating at me: Did you check any other luggage? I really hope so. It’s unsettling to think about someone traveling all the way across the country with nothing but a lamp. You wouldn’t have any clothes to change into! Even if it were only a 24-hour trip, you wouldn’t want to have to sleep in your blue jeans. That would be no fun at all. Guy getting on this plane with only a lamp, I have so many other questions. I wish I could just get up and ask you. But I can’t; the “Fasten Seatbelt” sign is on, and I don’t want a flight attendant to yell at me. Please know, though, that it bothers me to see you carrying a lamp on an airplane, and that in this confusing and scary world, you’re only contributing more chaos. You owe it to me and the other passengers on this flight—all of whom are surely just as baffled as I am—to explain the lamp so that we can all take to the sky with peace of mind.